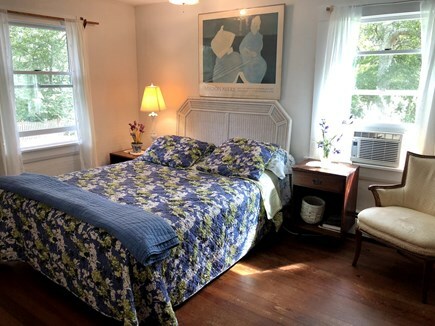 Our spacious home has 4 bedrooms with beds made when you arrive (all air-conditioned)2 full baths and sleeps 9, and is close to enough to walk to beaches, town and public tennis courts.The birch and slate kitchen is fully equipped (icemaker, dishwasher, washer & dryer, food processer, blender, toaster, microwave, stovetop griddle) There is a large private yard, deck, patio, outdoor shower & gas grill. 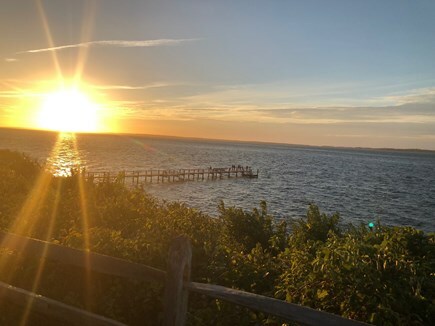 It is located on Vineyard Haven's quiet beautiful West Chop, easy walks to Outer Harbor Town Beach and to Main Street's shops and restaurants. The neighborhood is made up of well-cared for year round residences. The 24 foot long living room opens into a large dining room seating ten with an open breakfast bar and sliding doors onto the deck. 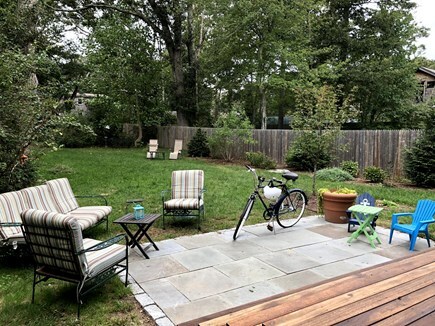 Step out onto the deck for breakfast coffee or down to the patio with comfortable seating in a large landscaped yard, shaded with tall oaks and full of birdsong with hammock, stone wall, room for badminton, volleyball and croquet. 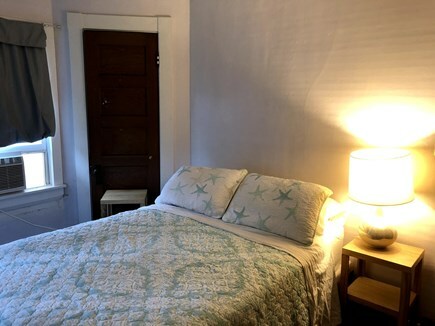 The comfortably furnished house has 4 bedrooms (one queen, one full and two with 2 twin beds each, and a small sleeping room on an enclosed porch which can hold one more guest), and two tiled bathrooms (1 deep soaking full tub with shower, one gorgeous fully tiled shower with bench). 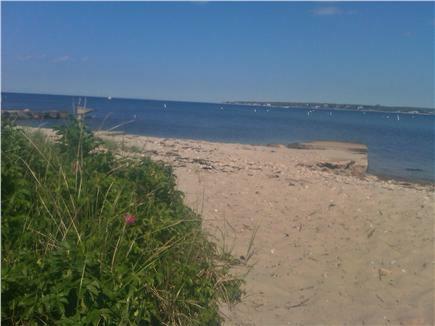 Linens, beach towels, 4 reclining beach chairs, bags, toys, umbrellas, boogie boards and a pop-up sun shelter are included. While the house is not handicap accessible, and the front door has two steps up, there is a first floor bedroom (small) and first floor bathroom (one step up and on other side of house from the bedroom) with a sit down shower. We have happily rented this home for four years. We found it even more comfortable in 2018. The owners built a new deck, a flagstone patio and landscaped the large backyard with flowering trees and shrubs. We can relax while our kids run and play. We love the grill, hammock and outdoor shower. The house is kid-friendly with stair gates, child-sized furniture indoors and out, games, videos, croquet, badminton and volley-ball, and for the beach, sand toys, boogie boards, sun shelter, umbrellas, beach chairs, cooler and beach towels. One town beach is an easy walk, even for little kids. The neighborhood is quiet and full of year-round homeowners. It is a treat to arrive to a house with the beds all made. One of the bathrooms has a soaking tub and the other has a sit-down shower. The kitchen is fully equipped-there is a stovetop grill, everything from lobster pot to cookie sheets. The dining room table seats eight or more. There is parking for two cars. Lovely vacation home that feels like home! It is a treat to arrive to a house with the beds all made. One of the bathrooms has a soaking tub and the other has a sit-down shower. The kitchen is fully equipped-there is a stove top grill, everything from lobster pot to cookie sheets. The dining room table seats eight or more. It was also nice to have two parking spots, as my husband had to arrive a few days later than the kiddos and I. The owners are very responsive and flexible, and answer questions and solve problems right away. Thanks, Lee & Albert! A+++. Lee was wonderful to deal with -- was always a phone call away if we needed her. The house was clean and cozy. Everything we needed for our vacation was available. Would definitely rent this lovely home again. My family and I had a very pleasant experience. Thank you, Lee! What a fantastic time we had!!! This is the fourth time that I have had the pleasure of staying in this home for my vacation. It easily accommodated our three couples. With two ful bathrooms, we effortlessly got out of the house each morning to seek new adventures! The house was clean, well stocked with everything we needed and is so conveniently located. We all cannot wait to return again next year. Thank you so much, Lee and Albert! Comfortable house for a young family, fabulous landlord! We found this house to be exceedingly comfortable for a family with young children. 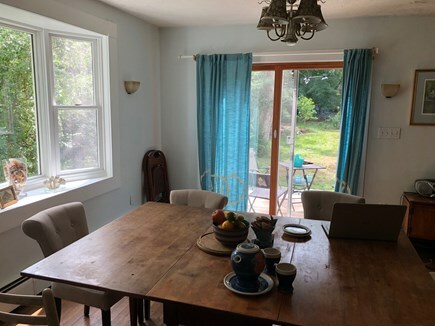 The furnishings are practical and well worn, so we were not worried when our toddler decided to bang things on the coffee table or when he would play the piano. This was enormously beneficial to us as parents and enabled us to enjoy the house without constantly worrying about any potential damages that would be unwittingly inflicted by our toddler. We really enjoyed the open kitchen/dining room/living room layout, which enabled us to cook while friends were eating breakfast in the dining room and children were playing in the living room. 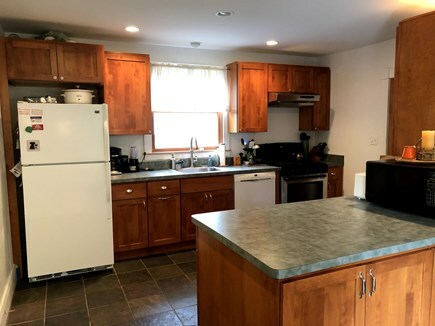 The kitchen is updated and modern, with ample cabinet space, a gas stove, and a center peninsula for preparing food. It is also well laid out and there were ample dishes, glasses, silverware. The bathroom off the kitchen is spacious and modern. The washer/dryer are conveniently located off the kitchen. The shower in the downstairs bathroom with the pebble flooring feels like you are showering in a spa at a fancy hotel. 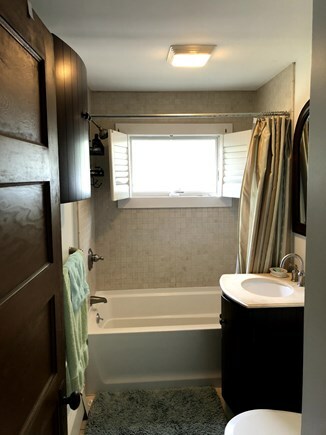 The bathroom upstairs is also nice and the bath tub is great for bathing children in (sometimes two at a time!). The outdoor shower is to die for. Everyone simply raved about it. We liked the little deck off the dining room and the yard with fresh vegetables and herbs. The older kids played soccer in the yard and had a blast. The 3rd parking space in the back was a God send. 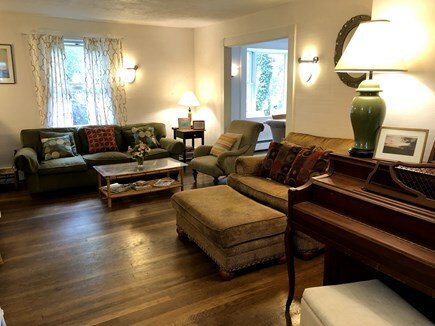 We really liked how the bedrooms are all upstairs, so we could put the kids to bed and then have "adult time" downstairs after 8:00, enjoying a leisurely dinner and doing work on laptops. 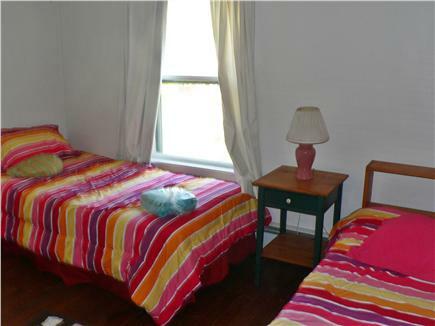 The bedrooms (even the tiny one) are all spacious and comfortable, with ample bedding and linens. The mattresses are a bit on the older side and could be updated, but this is a minor complaint. Most of the bedrooms have A/C which was great on warm nights! The location is convenient to Vineyard Haven, where we frequented the Stop and Shop, the Black Dog Tavern bakery, Mad Martha's, and Net Results for live lobsters and oysters. Lastly, the landlord was a dream to work with! She was very attentive on email and answered questions right away (e.g. do you have a lobster pot?). When the dryer stopped working, she had a repairman there right away. We have rented several summer houses over the years, and this was by far our most positive landlord experience yet. I stayed at this rental last summer and returned again this year. I was just as happy with it this year as I was last. The house is very cozy and inviting. I really just needed to arrive ... the homeowners have the house very well stocked for all of your vacation needs. 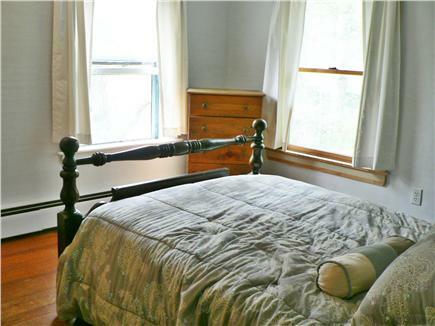 The location is great being only a short walk into town and a quick car ride to many of the local attractions! Amazing rental! I cannot wait until next summer to return again! What a perfect place to spend our vacation. The house is roomy, comfortable, clean and very well stocked - the kitchen has everything you could possibly need to cook your meals at home. The location is fabulous! 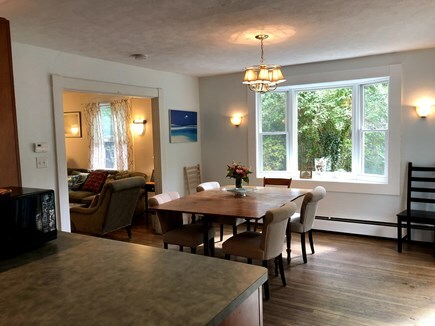 It's on a quiet residential street walking distance from the town of Vineyard Haven. 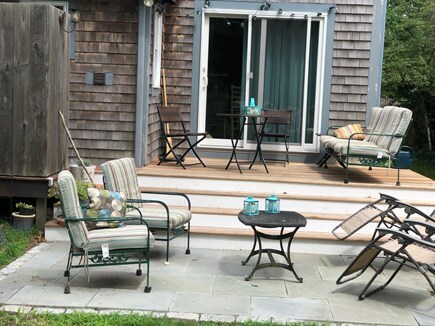 The back deck is lovely - a perfect place to sit and read or to just enjoy the garden views. We stayed here for one of the best vacations we've ever had. Really comfortable house and clean as a whistle. 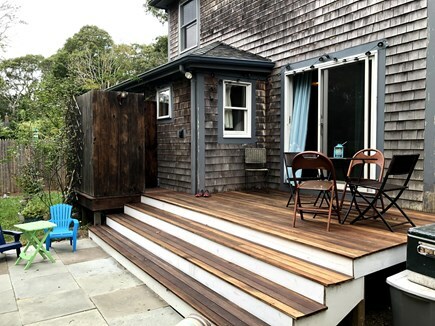 Gorgeous and good-sized backyard-- love the deck. Being from NYC, to able to walk into town instead of the usual vacation thing of getting in a car all the time was a big plus. The people who own the house are attentive but cool."